I ran 8 X 2 minute fast runs, with two minute jog recoveries , with a ten minute warm-up and cool-down at either end. There was quite a strong wind, which slowed me down sometimes. I didn't do a long run on Sunday, due to a cold, so went this morning on a bit of the Beachy Head route to Alfriston and back. It was quite chilly at times on the tops of the hills, and the autumnal feel was enhanced by the pop-popping of guns in the woods below. Total last week, (not including today's effort): 27.28 Planned total: 30. I ran with Claire, Jana, Joanna and Steffi, through Stanmer Park and the woods. I did a timed run on a couple of circuits of the roads near home. Today I did an easy run in the afternoon from the sailing club out to the Newhaven East Pier, then back the length of the front and up to home. No heart rate reading, for some reason. I hope this is not due to the fabled curse of the Forerunner's firmware. I did Sunday's long run this morning, and I would have been better not procrastinating, for the first third of the run was done in pouring rain. I went to Firle Beacon and a little way beyond and the tops of the hills were covered in thick mist. Today should be a long run day (1 hr 30 min at this stage), but I'm going to do it tomorrow. A certain amount of flexibility is permitted, I think. On Friday I ran a short run with Jana, Jo (a new recruit to the Friday runs) and Steffi. I'm quite tired at the end of the second week, but so I should be. 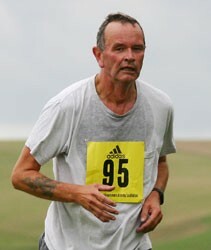 Ten weeks till the Beachy Head Marathon.